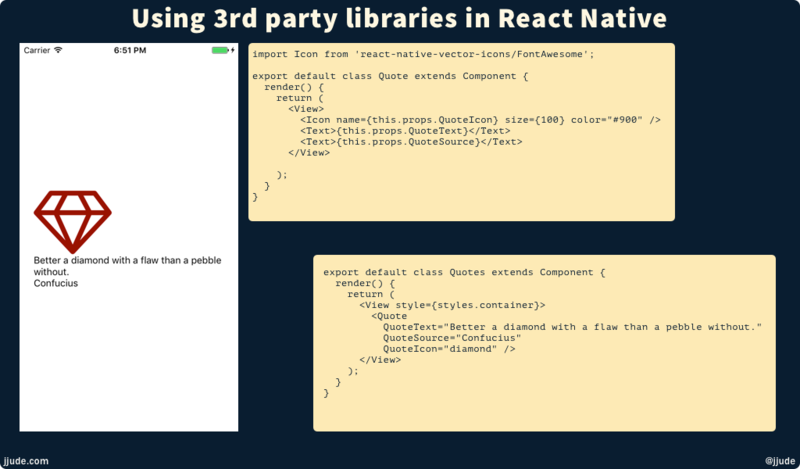 In this tutorial, we will learn to use one of the library from the ever expanding React Native ecosystem. Though React Native is relatively new, a large ecosystem has grown around it. Awesome React Native is just one list that documents the ever growing ecosystem. In this tutorial, we will learn to use one of the library from this ecosystem. FontAwesome is a popular font toolkit for the web. Joel Arvidsson has created a version that can be used with React Native. We will use this library to display an icon in our app. We will base our discussion on what we built in the previous tutorial—Creating a Custom Component in React Native. In that tutorial, we created a custom Quote component. In this tutorial, we will display an icon on top of the quote. If you have not yet read the earlier tutorial, this is a good time to read it. To use a 3rd-party library, we need to install it first. Since React Native is based on npm, we install the 3rd-party library like any other npm module. If you use expo or create-react-native-app to create your apps, you don’t have to link the library. Else you need to link the library with react-native link. Once installed we can use the library by importing it into our code. This library has many font bundles in it. We are going to use FontAwesome. Search for the icon you need to use it. That is it. Simple isn’t it? QuoteText="Better a diamond with a flaw than a pebble without."